I've been doing a regular opening keynote for the Google Squared programme for well over a year, and more recently they asked if I would also run a session focused on organisational agility and change. This was pretty fortuitous as it gave me a chance to pull together lots of disparate strands of thought, a number of which I've talked about here before now. The slides are pretty visual so for the sake of context I've listed out some links to key blog posts of mine which give more detail on what I'm talking about. I began with some of the challenges, focusing on Professor Richard Foster's work on the decline in company longevity (slide 2), and talked about how organisations become 'sticky' and resistant to change (slide 6), how ideas often have lonely childhoods (slide 7) because they alter the balance of relationships within companies, and how important it is to question the toxic assumptions (slide 9) within markets or businesses. One of the key challenges of-course is that of delivering on short-term targets and incremental improvement on business as usual, whilst still creating the space to develop game-changing ideas, and then potentially managing competing business models in the same business (slide 10). The example of Amazon's long-term view (slide 11) is an interesting antithesis to the norm here. And then I talked more about culture, and why we need not just creativity, but empirical creativity (slide 12) and a culture of learning in our companies. What happened with healthcare.gov (slide 13, 14) is a good exemplar for how the wrong kind of culture and a failure to test and learn can build up risk over time. There is of-course an important difference between change, and meaningful change (slide 15), and a real danger in the digital magpie syndrome (slide 16 - chasing shiny technology without also focusing on the culture, vision, behaviours, processes that support it). 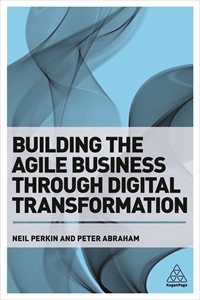 So agile is more than just a collection of working processes, and speaks to a much broader opportunity about organisational culture, innovation, approaches, structures, ways of working (slide 17,18). It's impoortant to recognise what culture is really all about - people. Mapping strategy, structure and process to motivation, and the potential benefits of self-organisation, small, nimble, flexible, multidisciplinary teams, flatter structures. The importance of vision and purpose, empowerment, autonomy, mastery (slides 19-25). I then gave some examples of bringing agility to non-agile environments and what that meant in terms of changes in approaches, from Harper Reed (ex-Obama campaign CTO), and the Government Digital Service of-course (slides 26-28), and companies that embed entreprenurial practice in resourcing (like Intuit - slide 30), and the 70,20,10 model. And then onto making change easier through breadth of innovation (slide 33), fresh perspectives (slide 34), an ideas from anywhere approach (slide 35), recognising the value of connected employees (slide 36), rapid prototyping, and recognising that you need to be good at every stage of the innovation value chain (slide 39). I went on to talk about how change is a process, not an event (and my own personal example of this, slide 40, 41), Kotter's change model (slide 42), top-down bottom-up change (slide 43), technical and adaptive change (slide 44), the key elements of organisational change (slide 45), the power of habit and remaking new organisational habits (slide 46, 47). And then from a more personal perspective, why it's so important to surround yourself with the right kind of people (slide 48), how systems trump goals (slide 49, 50), and I ended with some thoughts on why practices like blogging are good for the career as well as the soul, the importance of side projects, and why we shouldn't be afraid to ask the awkward questions. Looking at all those links makes me realise (again) how valuable this blog is to me in terms of expressing and organising thoughts and ideas. It feeds into so many things.